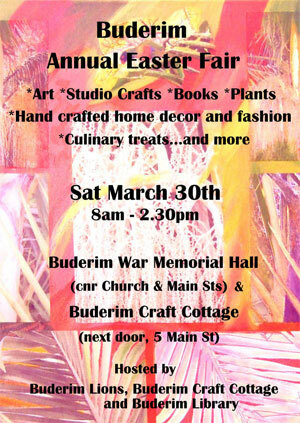 The Buderim “arts precinct” of the War Memorial Hall and Craft Cottage will be full of life and colour on Easter Saturday, 30th March. The Easter Fair has been held annually in the precinct since the 1960s, and continues to be one Buderim's favourite events. Once again it is to be hosted by three Buderim community groups, the Lions Club , Craft Cottage and Buderim Library. The organisers are promising an outstanding array of market crafts, pre-loved books, plants, and hand-crafted fashion, together with art and studio crafts from some of the Coast's finest artists. Home-made gourmet goodies will complete the line-up. The Hall will host market stalls and the Library book sale. More market stalls will occupy the grounds between the Hall and the Craft Cottage. The Craft Cottage's studio complex will be filled with art and artisan craft by its 300 plus members. The famous Lions BBQ will be in operation, and the “cafes'' at the Hall and the Craft Cottage will be serving tasty treats from opening time, 8am, until the Fair closes at 2.30pm. Buderim's War Memorial Hall is at 3 Main Street (corner Main and Church Streets). Buderim Craft Cottage is next door at 5 Main St. Several public carparks are nearby. Parking will also be available in the school carpark right opposite the Hall, by gold coin donation.